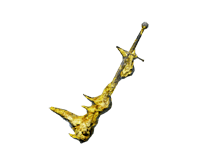 A straight sword affixed with yellow quartz. This longsword was found in the Iron Keep. and still inflicts very significant damage. as a display of strength to the world. doomed the castle to sink into a lake of fire. One sold by Chancellor Wellager for 8,000 souls after defeating the Looking Glass Knight. Part of the preorder bonus, received after character creation. Cannot be sold or thrown away. 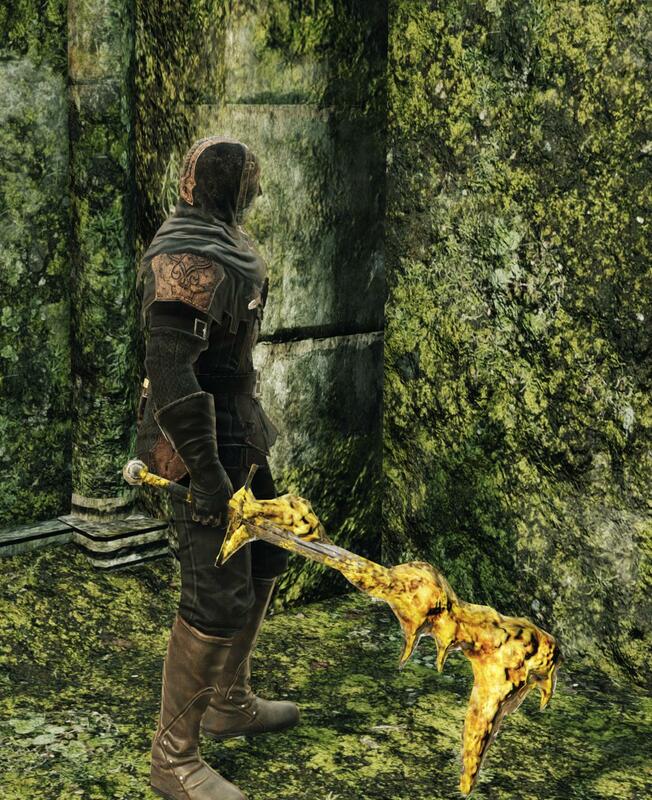 An ordinary Longsword encrusted with hard yellow quartz. Scales worse with stats, does slightly less damage, demands more Strength and is twice as brittle, but is lighter to carry and deals more damage on critical hits. Paired with the Yellow Quartz Shield. Reduces: Base damage, STR and DEX stat bonuses, damage and aux effects reduction. Adds/Increases: Base magic damage, INT stat bonus, magic damage reduction. Adds/Increases: Base fire damage, INT and FTH stat bonus, fire damage reduction. Adds/Increases: Base lightning damage, FTH stat bonus, lightning damage reduction. Reduces: Physical base damage, STR and DEX stat bonuses, damage and aux effects reduction. Adds/Increases: Base dark damage, INT and FTH stat bonus, dark damage reduction. Adds/Increases: Base poison damage, poison damage reduction. Adds/Increases: Base bleed damage, bleed damage reduction. Adds/Increases: INT stat bonus (excluding weapons that have base magic damage). Reduces: Base damage, stat bonuses. Adds/Increases: Damage scaling from lowest stat. Counter Strength: Damage multiplier when hitting an enemy that is performing an action such as attacking. Value of 100 means no extra damage. Poise Damage: The ability of the weapon to break the poise of an enemy. The Stats Needed determines how high various Stats must be in order to wield the weapon effectively. while lower-than-required Magic and/or Faith will reduce the Magic damage of the weapon. The Stat Bonuses rating indicates the level of bonus damage you do with the weapon, based on the associated Stat. This rating can be S, A, B, C, D, or E (in order from most to least bonus for the associated skill). See Scaling for more information. D is the Intelligence and Faith stat bonus that influences the Fire attack of the weapon. E is the Faith stat bonus that influences the Lightning attack of the weapon. F is the Intelligence or Faith stat bonus that influence the Dark attack of the weapon(The lower of the two stats is chosen as the bonus stat). The Damage Reduction % of the weapon. It dictates how much damage the weapon mitigates while blocking. The Aux Effect Reduction % of the weapon. It dictates how much of the effect the weapon mitigates while blocking. Durability: The durability of the weapon. to infuse the weapon it cannot be enchanted by items.